We submitted the withdrawal letter today... Most schools need only 1 month notice but not for their school, they need 2 months, hence we submit the letter today. It was mixed feeling.... I was happy that we had finally made up our mind but at the same time, quite sad. They have been in the school for quite a long time. L has been there since she was 20 months old and Z was there since he was 18 months old. I have always been very active in their school, doing charity project or volunteer during their field trips. So I think I will miss that too. There's lots of reasons why we need to pull them out from the school. It's not appropriate for me to mention it here. Let just say we think it's time to move on. I have yet to break the news to them. I don't think they will have any problem taking the news. Since they like spending time with me. Sometimes L will tell me that she would like to be in school for half day and Z forever happy when I ask him if he would like to stay at home with me when he was sick. Next year onwards, they will be in school for 3 hrs instead of full day program. We've enrolled them into a church kindergarten. I'm sooo happy that we chose this school! I don't think I can trust childcare anymore. Since 2 weeks ago, I've been looking around for enrichment programs for them. I will quitting my part time job by end of this year too. I have the job for a year so I don't think I will miss it and I've promised DH that I will only work for a year. That also means no more long hours on the computer, hehehe...... Do I look forward to it? Of coz I do! I get to spend more time with my kids and the church kindergarten is more academic. I'm already making plans what to do with them during their free time! L & Z chose what they would like to dress as for the costume party in school. Ohhhh... Look how lovely they are! This year was slightly different from the past few yrs...... We invited my best friend, Doreen along. If William was not working, he would have joined us. Probably because of age, we always make it a small affair (very old? Nah... Just kidding! Gagaga...). There were 2 yrs that DH was not around with us. 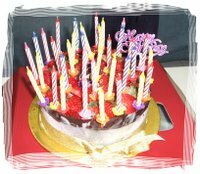 I bought cake for myself those 2 yrs, coz L & Z simply loves it! 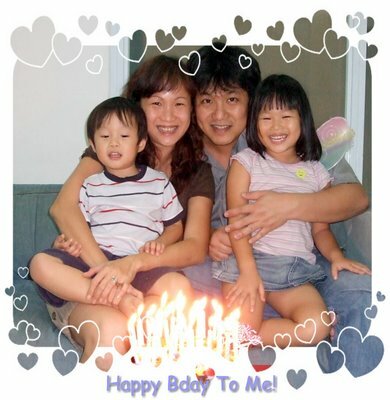 They loves blowing candles and singing bday songs. For DH's bday we had a chocolate cake which was Z's favourite so for my bday, Doreen was sooo sweet to buy a strawberry ice-cream cake, which was L's favourite. We had dinner at a Japanese restaurant along East Coast Beach. 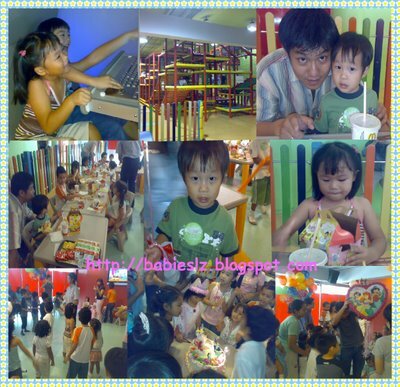 I like it there coz they serve pretty good food and they give children lots of attention. Besides giving them lots of toys and chips as giveaways, they make effort to serve them first. It's Halloween & it's my Birthday! L's right eye were swollen. DH brought her to the doc in the morning and asked him if it was alright for us to go out. Doc said it was inflammation and it was alright to go out as long as she wear her sunglass and to put eyedrop for her every hour. He knew girls like to be pretty so it's better for her to wear sunglass to avoid stares. Our Doctor huh, a very funny and nice man. So we went to goat farm with godparents as planned. L & Z were very excited! This morning Z has been asking me "going out now? ", "go feed the goat now? ", "can go now?" etc.... L would remind me to put eyedrop for her every hour. After feeding the goat, we wanted to go the bird farm but it was raining heavily. So we drove to farmart and we were glad it stopped raining when we reached farmart. We did prawning while L & Z feed the rabbits and the goats. Godparents were very sweet to take turns with us to take care of our babies. DH and me were hooked on prawning! In the evening we had our dinner at the place. The atmosphere was great, just like kampong. People do drive in just to have their dinner there. L & Z wished daddy Happy Birthday when they woke up this morning. L was very sweet, she drew pics for daddy as a birthday gift. Celebrated daddy's bday at Spring Court Restaurant which is his favourite restaurant with some of our close friends. 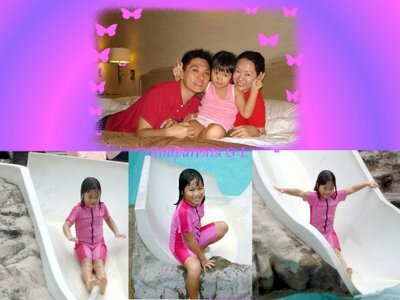 This morning daddy feel like having dimsum, and the kids wanted to see Godma again. 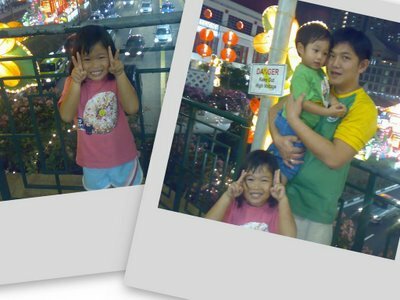 We picked godma from her home and went to Harbourfront for dimsum and then to Vivo City thereafter. 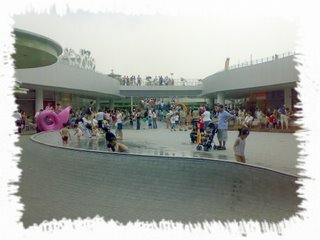 It was a mistake to go to Vivo City on a public holiday. The place was packed like sardine! What I like most was the toilet. Yes, the toilet! Z wanted to pass urine and as usual I was the one who had to bring him to the toilet. After he has used the toi;let then I realised that they have a little area (don't know what you call that) for little boys to pass urine! Wished I had taken pic of it but think ppl will be staring at me if I did that. Hehehe.... It was thoughtful of them to think of fixing 'that' in the ladies toilet. There was another great place for the kids which was the playground (top pic). He went to supermarket in the morning to get some food to cook for them (before I leave). After lunch, they had ice-cream and they took a nap. When they woke up, they played games together. I am so proud of daddy that he was able to handle them alone. Hehehe... That's means I can go for more MJ session right? In the evening, we had dinner together with our friends. It was another late night for the kids again. Last night when we reach home, Z asked where is jiejie. Told him that she was with godparents and I don't think he understand. After shower he asked for L again... He missed her alot. Then L called us using the video call! 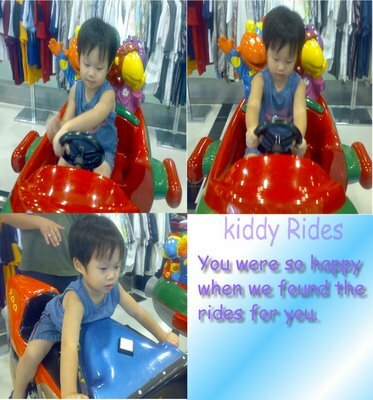 He was sooo happy that he told jiejie :"jiejie, come out!" Gagaga... It was so funny! I missed my girl very much that I slept on her bed last night. Silly me right? Anyway, this morning, Z asked for jiejie when he woke again. At 5+, we met godparents & L at east coast beach for dinner. L & Z were so happy to see each other. L was very sweet, she drew pics for us and they were beautiful. After dinner, we took a stroll along the beach. They were hoping that they can play with the sand but it was getting late. She is very lucky to have such doting godparents....... They check-in to a hotel last night. In the morning they had a hearty breakfast and after a rest they went for a swim. She did some drawings for us too. After checking out, they went shopping. Godma told me L was very well behaved which made me sooo proud of my girl. L's fever has subsided so we decided to carry on with our plans to go out with their godparents. 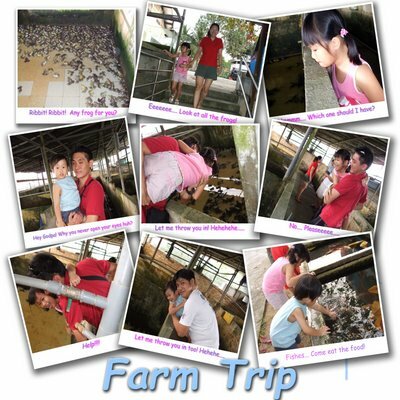 We went to the farmart at choa chu kang. It was our 1st visit and we like that place. We went to Hay's goat farm and a bird farm too but they were closed :( We were driving around looking for other farms to visit and we were lucky to find the frog farm that was still open. My! There was lots of frogs and L & Z fed the fishes in the pond too. It was time to say goodbye to godparents and my girl.... L will be staying overnight with them tonight! Ohhhh... We'll miss her tonight. She was all excited abt it and told me that she will miss us. Oh No! She's Having Fever! My Girl Has A Boyfriend! I was chatting with D over the phone when I found out that my girl has a boyfriend! D told me that my girl had a conversation with godpa and told him she has a boyfriend, can't remember what they were talking abt that lead to this. I was curious and I had to find out more from L while we were walking home from the supermarket. Me: Sweetie, do you a boyfriend? L : Mommy, why u ask? L : Yes. I have 2 boyfriends. Me : Huh? How come you have 2 boyfriends and mommy doesn't know anything? Would you like to tell me who they are? L : Sorry mommy.... It's Harold & Ollie. We always play games together and I like them. Me : U mean Ollie noticed when your hair is longer? He is very observant. Next time you must tell mommy ok? Mommy is sad when you don't tell me. L : OK mommy... I tell you everything but I forgot abt this. School pushed forward the PTS for K1.... Probably they knew lots of us are planning to leave the school. Our meeting with her teacher was at 1730hr. We started the session with her English teacher, Ms L. She told us that L is progressing very well for her social & development skills. She highlighted that L can read very well which I doubted.... Miss L knew that I was concerned abt L's reading skills. Hmmm.... When she asked if we have any questions, we said no. I don't see the need for me to voice my concern if I have made plans. To me, the idea of having this session was for them to assure us that our kids are doing fine in school. I know that my kids have lots of fun in school but not in terms of academic. I like the session with Ms Z. She told us the truth that my girl needs to improve on her chinese, reading skill. She also said that L has started using mandarin to converse with her too without her prompting. I have enrolled her on Chinese enrichment class next year so hopefully that will help. We do reading together too. We found out that the school will be shifting by mid of December.... That means my babies will have to be in the new school for 2 weeks before we say goodbye. L's writing skill has improved. Everyday I will encourage her to do some writing but if she's tired, I will not force her. Most of the time she speaks English to us but lately she try to ask questions in mandarin too. Normally she will only speaks Mandarin if I ask her a question in Mandarin. She is very happy when I praise her for doing that and she would want me to tell Miss Zhuo abt it. Z enjoyed the duck soup that daddy prepared for dinner. Yes! Daddy cooked in the morning while mommy took a break. :) I gave him the drumstick and he liked it while jiejie rather have the bones removed. He asked for more (with bones) after he has finished it. When he saw daddy having otah, he wanted it too so daddy let them try it. It was their 1st time having it. L & Z asked for water after the first bite. L did not want it anymore but Z asked for more! We went to another party today, it was Brandon's birthday..... Mommy Katheleen prepared lots of yummy food for everyone and ther was a magician! He was good and everyone were laughing throughout! When we saw the cake, we were wondering where did she ordered the cake from and we found out she made it! It was a beautiful cake. 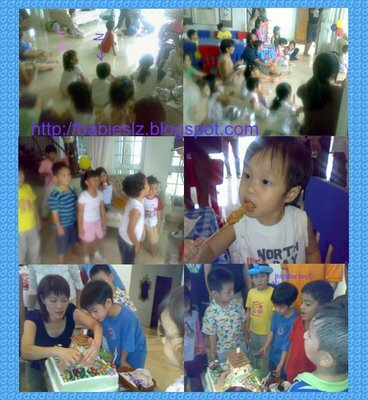 This morning we attended Rachel's birthday party at Downtown east..... It was a great party for everyone! 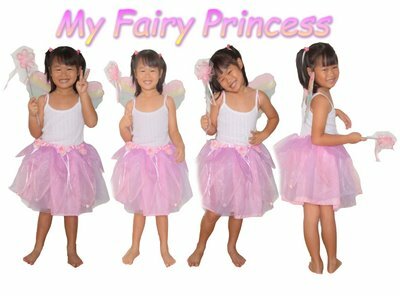 Games, happy meals, piniatas, tattoos etc... R looked so pretty with the princess dress. Some of us will be meeting again tomorrow for Brandon's party! Since last week, Z managed to remove his clothes without our help! Sometimes he does need L or my help but most of the time he will try to do it himself. He likes to say "I do it myself", whether he's trying to put on his shoes, wear/remove his clothes, brushing his teeth etc.... Just 2 days ago, L had just got to switch on the toilet light for him so that he could use it and he did it without asking me to go with him! He asks lots of questions, "what you doing? ", "why? ", "U OK?" (esp if anyone of us will to say 'Ouch' or hurt ourselves) etc... If I'm busy in the kitchen, sometimes he will offer to help, "mommy, I help you?". 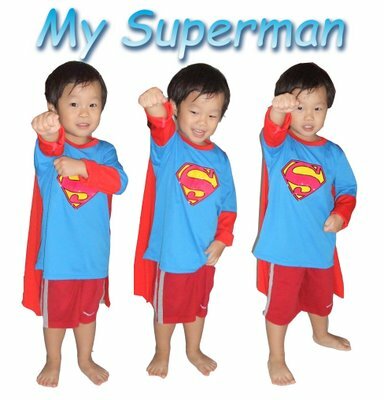 I'm glad that he asks lots of questions coz to me, kids will learn more if they ask and this will be very helpful when they start school. When he comes back from school and I ask him to clear his bag, he used to say he wants to clear only his snack box and bottle and the rest will be Jiejie or me doing it for him. Now, he will happily clear his bag! Putting things in the kitchen and laundry basket respectively. He will even help L to put her bag at the right place if she forget! Sometimes when he play with his toys, he likes to take out lots of different toys. I have set a rule that they can only take a out a set of toys each time they want to play. Most of the times he doesn't do that( L does most of the time) and I have to remind him but lately he does! Whenever, he wants to play other toys, sometimes he will say "mommy, keep this first right? "/"1 toy only?" or try to keep the rest away first. He loves to show affections to us, like kissing us or say 'I love u'. What more can I ask for? I'm sooo happy with his progress! 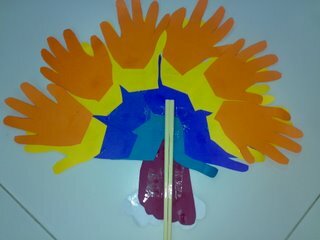 Did a peacock with the shapes of their hands and feet. Slightly different from the website. Used the sticks so that it's easier for them to hold. Very simple craft. I help them to trace their hands & feet. L tried to cut the shapes and I did it for Z. They glue it themselves. We went to check out the Tae Kwon Do class and didn't expect L to go for the trial lesson. She probably looked so keen to learn that the receptionist offered her. Why we thought of sending her for the lesson? Well.... Because of daddy lor.... Sometimes when we are at home, daddy will be doing some kicking and punching and L would learn from him. So thought of sending her for formal training. Besides that, she will learn abt discipline and it is a healthy sport. 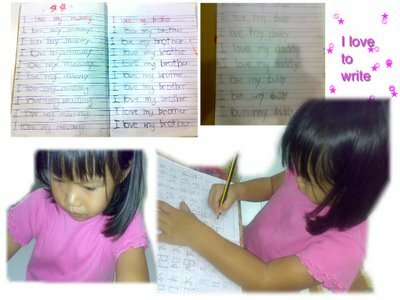 We told her that if she wants learn this, she has to remember never to use it to fight with anyone or to bully others.. In the evening, she asked daddy to practice with her what she has learned today. And Z? He told me he wants to learn too but the minimum age is 3 1/2 yr old, so he will has to wait till next year. Meanwhile, I believe daddy will be more than happy to give them some lessons. 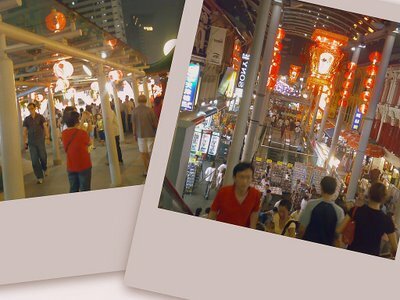 We went to Chinatown this evening, had our dinner at the hawker centre, went to the pasa malam and walking street. I have never taken a car lift and I was more excited than L & Z! 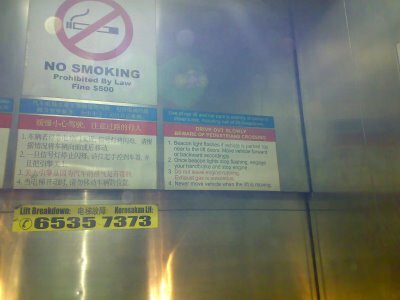 It was good that it brings you to the level but the waiting time was quite long. 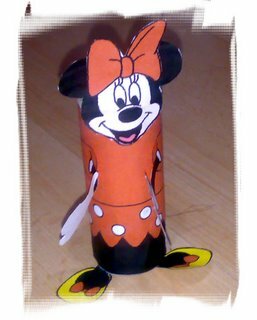 One of L's favourite character is Minnie. This is for her! Every Thursday, L will be extremely well-behaved. Why? Her favourite show, Fear Factor will starts at 8PM. She was upset that she missed the show for the past 2 weeks. This video is for her! 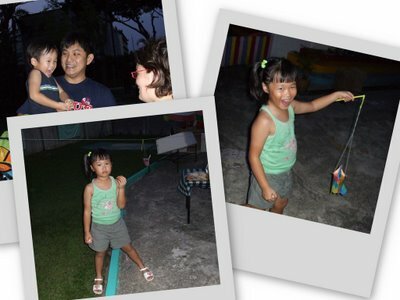 The school organised a mid-autumn festival and pot luck party. I forgot to bring their lanterns to school and L was nagging at me. Lucky she made a lantern in school. Teachers has been asking Z if he would like eat before I arrived but my boy wanted to wait for me. When I arrived, he immediately told me what he wants to eat. 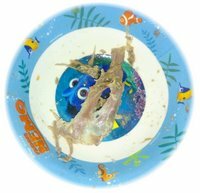 As for L, when she had enough fun with her friends then she decided to eat. A year ago on this day, Z fractured his left arm while running in the house. He was crying very badly coz he can't lift up his hand. When we arrived at the hospital, he was alright, forgot the pain and was running everywhere. Doctor said it was a hairline fracture. We were worried but the the doctor assured us that he will recover faster than adult. A week later, we went back to the hospital to change the cast and checkup. When we were there, we didn't see anyone as young as him having a cast. He was only 22 months old. We felt guilty..... We didn't think that we did a good job taking of him, hence the injury.... 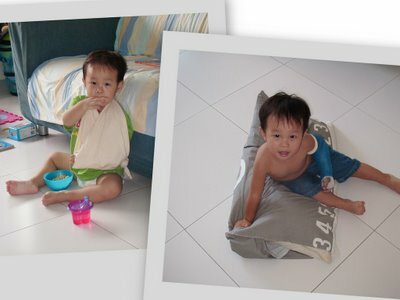 When he was removing his cast, there was this boy who refused to do it. I was so proud of Z, he was not afraid at all. The nurse tried to turn him away when he was trying to 'saw' the cast but he insisted on watching. Before his injury, he used to do things with his left hand but now he uses his right hand more. Till today, whenever I'm holding his left hand, I'm more cautious, worried that I may hurt him though the doctor has certified that he has fully recovered.